AR (Augmented Reality) is one of the hottest acronyms in technology right now. But what role will audio play in this exciting new world? In order to provide a holistic AR experience, audio must and will be featured as a prominent part of the development and consumer experience. At HARMAN, futurists like Armin Prommersberger, SVP of Technology for Lifestyle Audio, are working to realize this potential. 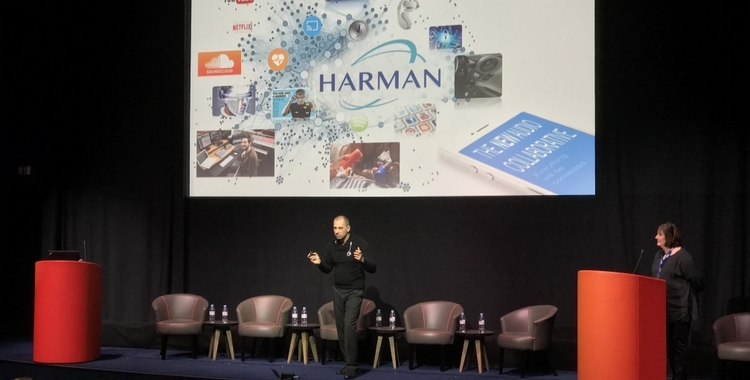 This week Armin spoke with leading members of the audio and music sectors at a Futuresource event in London on “The New Audio Collaborative” and how AR leaders must unite to create products that are truly integrated in a connected world. In simple terms, AR supplements the “real world” with additional content. Unlike VR (Virtual Reality), which creates a completely artificial digital environment, AR integrates digital elements with your physical surroundings. One of the most prominent recent examples of this is smartphone app Pokémon Go. The popular gaming app is a major step forward in the incorporation of digital visual elements, but without consideration of audio, it’s yet to provide a truly immersive experience. To achieve this next level, mobile and audio providers need to come together, and it’s something we’ve been focusing on at HARMAN. One example is a product we are developing with technology partner, LifeBEAM. LifeBEAM’s Vi is the first true artificial intelligence personal trainer. It uses HARMAN technologies to create an entirely new and different approach to fitness. Each day, the Vi tracks its user and builds on this information to provide relevant, personalised coaching that helps users achieve real results. These include meeting weight goals and improving running, all while providing quality music and phone capabilities for an all-encompassing audio/visual experience. This kind of connected, personalized and contextual “Smart Audio” is the key to creating authentic AR, but it can’t be an afterthought; it needs to be integrated at all levels of development. A simple pair of headphones, for example, is becoming a sophisticated audio and software system that continues to improve with each use. With the enhanced ambient awareness of products like the JBL Everest Elite headphones, you can truly immerse yourself in AR apps like Pokemon Go by blocking out the sounds you don’t want while allowing the user to hear important sounds like subway overhead announcements, bicycle bells or someone calling your name. This kind of technology and its applications can only improve as we work to develop intelligent and personalized products that incorporate innovative technologies and features such as voice control and speaker interconnectivity – allowing users to enjoy a seamless experience across all their smart hardware and mobile devices. Developing audio for AR is not without its challenges, but as technology and consumer expectations evolve at a rapid rate, HARMAN will be at the forefront. This is a tectonic shift from the closed-shop mindset the audio industry has evolved from, and it’s up to us to help drive this change.